Paul Krugman's dream for Japan is finally coming true as BOJ embarks on a round of massive monetary expansion. Paul Krugman (NYT): - Let it not be said that the scribblings of academic economists have no effect. Some of us have been urging the Bank of Japan to get truly aggressive and adventurous on monetary policy — and it’s happening! And it only took 15 years. Seriously, this is very good news. Japan is finally, finally making a real effort to escape from its deflation trap. We should all hope it succeeds. Indeed we should all hope that Japan's central bank can solve the nation's problems, which are ultimately structural in nature. 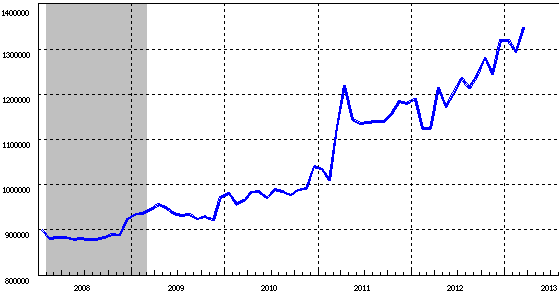 Krugman is referring to the ongoing deflationary trend resulting from the burst of Japan's property bubble - as shown in the land price index below. Japan's monetary base has already expanded dramatically in the past three years and is now expected to grow to multiples of that. Markets have responded in a "textbook" fashion. The yen sold off sharply, while banks and property shares rallied. The "reflation" of Japan is on.